The west side of Col du Tourmalet viewed from the top -- the highest paved road in the French Pyrénées at 2115m (6939') Scroll » right to view the full panoramic photo. The formidable reputation of the French Pyrénées is what intrigued me most. That the best cyclists appear to suffer like mere-mortals each year during the most crucial stages of the Tour de France is a sadistic lure of this great mountain range. Of course, I also wanted to check out, first hand, the beautiful, rugged scenery. 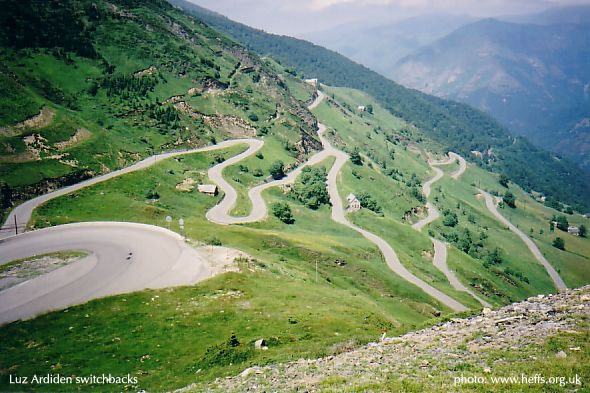 A tour of the great cycling climbs would be incomplete without the legendary Tourmalet, Ausbisque and so many others. Rebecca, on the other hand, has been there before. 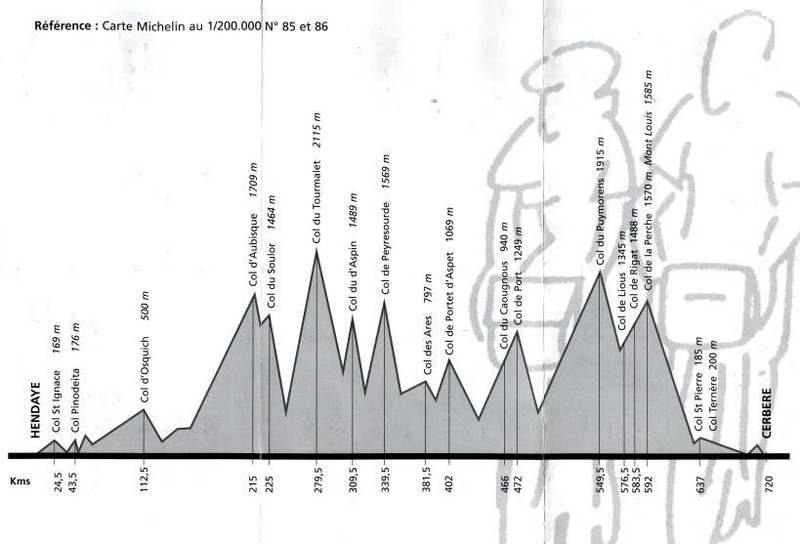 Two summers ago, she completed The Raid Pyrénéen [profile]. 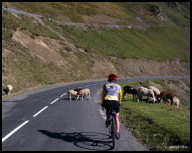 This is a loosely organized event that requires riders to cycle 440 miles (710 km) across the Pyrenees, from the Atlantic to Mediterranean, over 18 cols (with checkpoints) in under 100 hours. Rebecca and her friend Nancy did a self-supported raid (i.e. no SAG), two years ago, in just 4 days! By the way, SAG is an acronym for Support And Gear (or Sick And Grouchy if you are having a bad day) with an accompanying vehicle. Those four days were a bit of blur so she was looking forward to revisiting the famous cols and experiencing the smaller roads on a less hectic schedule. 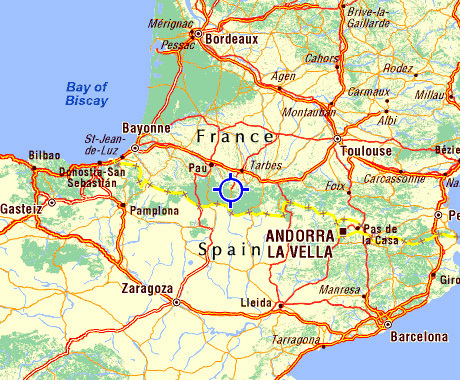 Our first stop was the Hautes-Pyrénées (High Pyrenees), a mountainous agricultural landscape of villages, farms, fields, upland pastures and, of course, winding mountain roads spanning the border between France and Spain. We arrived late morning at the office de tourisme in Argeles-Gazost, looking for a plan de ville and to a book a hotel for our two nights in la vallée des gaves. Although I had roughly charted some rides and done preliminary hotel research, there was logistic work still left to do. I had read that Argeles-Gazost is busy, and after driving around this small, congested town you realize that it's not a great place to hang your hat for several nights if you're looking for a quiet retreat. So we were pleased to find a hotel in St. Savin in the quiet hills outside Argeles-Gazost where we had a great view of the mountains leading up to the famous Hautacom climb and a historic Abbey (see photo gallery below). During the reign of the Roman Empire and later the Normans, St. Savin was built, destroyed and rebuilt several times. The Saint-Savin Abbey in the town square today (see video left) and its preceding monasteries were used by nuns and monks for almost 2000 years. In 1855, it was declared a historic building and it's now an Abbey in name only. Today, its only enemies are time and modernization. Once again you can count on monks to select a great location for a cycling base camp. 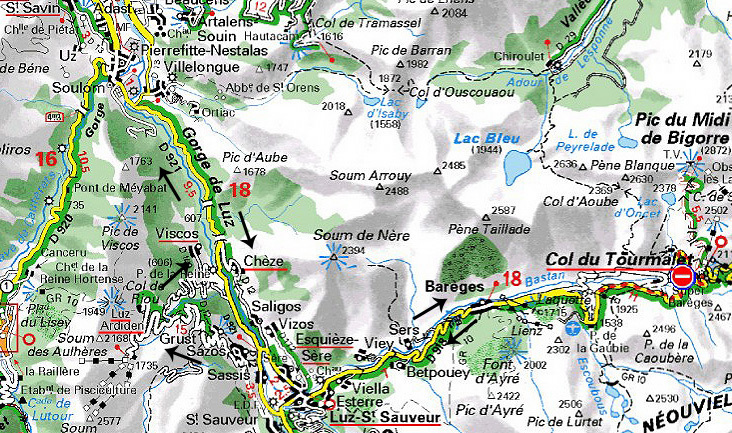 Many famous Cols are reachable from St. Savin, in several directions, without having to cycle through Argeles-Gazost. The hotel we chose, Les Rochers is run by a husband-wife team from Nottingham, England who have renovated and run the hotel for a year. Hotel le Viscos is the other place to stay in St. Savin. We had dinner there on our big night out and the authentic French cuisine was impressive. If you can speak a bit of French and don't mind paying a little extra for a true French experience then we recommend you take the demi-pension package at le Viscos. The combination of this hotel in a nice, quiet, charming town and great roads should satisfy any cyclist visiting this region. The Les Rochers is a little less expensive and there is no language barrier but neither the food nor the ambience is as good as at le Viscos. The service was excellent at both places. Considering the poor weather prior to our visit in the Hautes-Pyrénées we were lucky to have had two very good days of cycling out of three. We arrived at our hotel at noon, checked-in and then hurried out to take advantage of the sunshine. 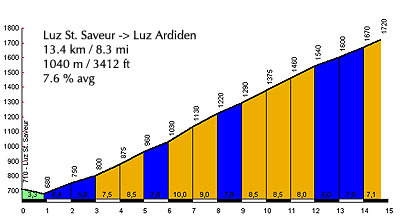 The plan was to start with an out-and-back along the most famous and highest col in the French Pyrenees, Col du Tourmalet, followed by a climb up to the ski station at Luz-Ardiden. From St. Savin, we had a short descent down to D921, which follows a gorge that cuts through the mountains. It was a rolling ride of 5k before the turnoff onto D12 and the short but difficult climb to the hamlet of Cheze, followed by a descent into Luz-St. Sauveur. This was our last chance for food, so we bought and downed two sandwiches to fuel up for the 18k climb up to the Col du Tourmalet. Back in 1910, the Pyrenees were first added to the Tour de France route, and the Col du Tourmalet was part of the experiment. At the time, the road wasn't much more than a sheep track barely wide enough for a car. (The sheep are still there... see photos below). 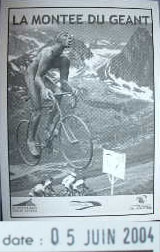 When Octave Lapize, who was some 15 minutes behind the leader, reached the pass of the Tourmalet in great pain and pushing his bike (see photo left), he saw a group of race officials and yelled “Assassins!” Lapize sucked it up, though, going on to take the stage and the overall title. In 1969, a Tour rookie named Eddy Merckx unveiled his immense strength when he waltzed away from his competitors on the Tourmalet, setting off on an epic 90-mile solo ride that left his nearest competitor eight minutes behind! “What this sublime cyclist did,” wrote then race director Jacques Goddet, "had never yet been written in the annals of the road." We weren't out to race the Tourmalet like Lapize, Merckx or Lance Armstrong, we were there to challenge ourselves physically and artistically -- stopping occasionally to take pictures and to soak it all in. Of course, stopping to take pictures after an extended section of steep 9% is also a good ruse. “Oh... (huff, wheeze), I'm not tired... (huff, wheeze), I'm just stopping to take some pictures (huff, wheeze).” With each passing kilometer, the French have erected signs to sadistically inform you of the upcoming average grade (steepness) for the next km and the distance and meters of elevation required to reach the top. As you approach a new sign there is a little eager anticipation. You'll find yourself squinting as the signs come into view trying to read the average grade -- is that 7, 8, 9 or worse... a double digit number! At the top, I recognized the unmistakable Solano blue camouflage cycling uniform of a local team. I introduced myself to Forrest who rides for Solano Cyclery a shop located just several miles from where my wife and I live in Berkeley, California. He had just finished a double Tourmalet and I took his picture (see photo gallery below) in front of the Geant du Tourmalet statue, a composite of all of the riders who have suffered racing up the Tourmalet, that marks the top of the col.
We climbed the Tourmalet from the more scenic west side, requiring 18 km (11 miles) of cycling with 1404 meters (4606 ft) of elevation gain with an average grade of 7.7%. 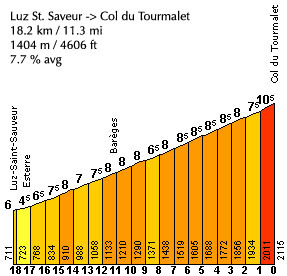 It's very tough with sustained sections of 8 and 9 % near the top and 10.5% for the last kilometer before the restaurant and Geant du Tourmalet statue come into sight. As I mentioned, the weather was beautiful with a vivid blue sky that every cyclist appreciates. The diesel fumes from the light to moderate traffic was the only thing we didn't enjoy. Looking down the Luz-Ardiden switchbacks made famous by the Tour de France. Nobody cares that there is a ski resort at the top, right? > hi565: You are the ride photo master! Thanks to Phillipe Crist from France, for pointing out the name and significance of the Geant du Tourmalet statue at the top of the Col du Tourmalet: "It's a composite of all of the riders who have suffered racing up the Tourmalet." Phillipe is a regular visitor to the Pyrenees and passes along another lodging recommendation. "Next time your in Argeles, check out the Gite d'Etape in Villelongue -- great ambiance, great value and great hostess!" Villelongue is just southeast of St. Savin on the other side of the road that follows the gorge through the valley and it's labeled on the map above. "Gites d'Etapes are relatively poorly known outside of France but provide tremendous value for the money. We paid 25 euros a day (about 30 dollars) for a room, breakfast and dinner. The food is simple but plentiful and the guests are often hikers/cyclists etc... and make for some good company." 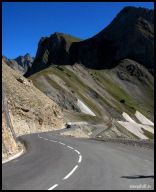 Check out Phillipe's Tourmalet and Aubisque photos. Phillipe has competed three times in l'Étape du Tour, a one-day timed event held in the Pyrenees or Alps each July. It's a big event. This past year 7885 people competed (8500 entered) while another 4900 were turned away! It seems like a neat event if your entry is accepted and... you show up early for a good start position as this UK couple found out in 2002. 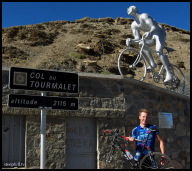 David, from North Wales, points out that the Tourmalet is the highest paved road in the French Pyrenees. Port d'Envalira, in the Spanish Pyrenees, is 2407 meters high and almost 300m higher than the Tourmalet. Thanks, the report has been updated. Dougie, from the UK, concurs with our assessment of le Viscos: "The food at the Viscos is amongst the best I've had in France and the chef/owner is a real character, and if you have a bit of French he'll talk your hind legs off about his creations. He also introduced us to a very very nice local wine , Pacharenc (a white Madiran)". Yes, the chef is up front all night and even takes your order after explaining the dishes is more detail then you'll ever want to know. He also speaks perfect English, but won't let on until you've made your best attempt with French. This seems to be the norm in all good restaurants in France... as it should be. One should always make their best attempt with the local language before following back to English. Starting a conversation in English, assuming the other person will understand, is considered impolite. I've added a fun 25 second movie that gives a brief tour of the peaceful St-Savin town square. 2001 Tour de France photo of Lance Armstrong and Jan Ullrich climbing Luz-Ardiden and from 2003, Lance pulling away from the competition and on to victory after his crash (see photos above). It may be worth mentioning that there is a cable car at the top of the Tourmalet that will take visitors another 750 meters higher, up to the Pic du Midi de Bigorre observatory, offering a 360 degrees panoramic view, 360 days a year. Rebecca captured it during one of our movies. The movie, aka “Oh baby, nothing but 9 pct!”, starts with a distant shot of the observatory, pans down to me struggling up the road and then pans up to the restaurant at the top of the Tourmalet. Email your anecdote or comment via Mail or other Email software (Outlook)... and sure be to tell us where you are from!